DOT continues to make progress with the extension of the Columbus Avenue protected bike lane. 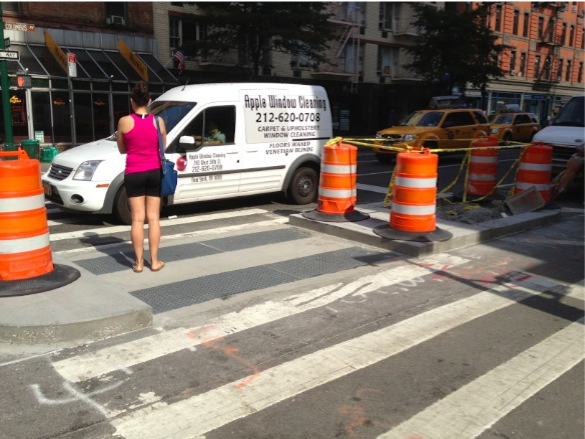 Doug Gordon sent us these shots, taken this morning, of pedestrian island construction at 75th and 73rd Streets. After gaining the support of Community Board 7, the lane is being extended north to 110th Street and south to 70th Street, where it will become a shared lane to 59th Street before linking up with the Ninth Avenue protected lane. 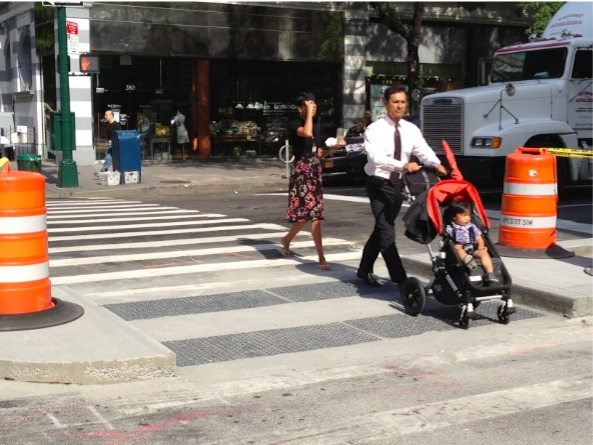 The first phase of the Columbus Avenue lane, from 96th Street to 77th Street, brought a 41 percent drop in injuries to pedestrians. Transportation Alternatives has mounted a campaign to improve bike and pedestrian safety on Amsterdam Avenue with a corresponding northbound protected route. Would love to see this on Amsterdam, especially in the two spots in the upper nineties where drivers have killed pedestrians in the last year or so. I walk over those spots every day. Saw some of these under construction at 106th last night, too. 4″ of concrete isn’t nearly enough. There’s a few of these going up in my city, and there’s 3′ deep planters on both sides, with a few inches of concrete surrounding a dozen tons of so of earth. They should all be built like that. At the very least, a couple of steel bollards on each side, sunk a few feet into the ground would help. Otherwise it’s nothing much more than one speed bump before the other ‘speed bump’, as a distracted driver won’t be stopped by 4″ of concrete. A couple sturdy steel bollards or a few dozen tons of earth wrapped in concrete on the other hand will mean an errant driver ruins THEIR day or ends THEIR life, not the hapless, innocent pedestrian’s. It would be great if the DOT would remove the 7-10 am no standing restriction on the opposite side of the street and designate it for truck loading and unloading. There is virtually no legal truck parking available on Columbus during these busy delivery hours. After 10 AM, this parking is shared with passenger cars and pretty much unavailable to delivery trucks. The result is rampant truck double parking resulting in added congestion. Look at the poor workmanship of the concrete bullnose which appears to be a monolithic concrete pour. The spec should be cast in place steel faced curb with concrete walks poured separate. Please visit the area after next winter. The concept is great but the quality of work questionable. The vast majority of street repair/rebuilding these days is of very poor quality. I often see manholes which aren’t flush with the pavement, wavy pavement, potholes repeatedly developing in the same spots, concrete blocks at bus stops out of vertical alignment (sometimes by several inches), etc. We really need somebody in charge of quality control. If a job is poorly done, it should be ripped out and redone at the contractor’s expense. Same thing if it develops defects before a reasonable period of time. Properly done concrete work shouldn’t develop cracks or spalling for at least 25 years.